Video: Who was the most underrated Dodger in 2016? Late in October on Twitter, I asked folks whom they would pick for the most underrated Dodger of 2016. It was a doubly subjective exercise, integrating not only your own perception of Dodger players but your belief in how others feel as well. From the dozen or so nominees, I picked out the four with the most mentions and put them in a decidedly unscientific poll, narrowly won by Joe Blanton. The earth spins, seven days of suns rise and set, and here we are once more. Two wins needed for land. Two games to do it, with two prime captains in Clayton Kershaw and Rich Hill. That’s the map of the world for the Dodgers, who find themselves back in the strait between exhilaration and elimination after losing Game 5 of the National League Championship Series tonight to the Cubs, 8-4. Barely a week ago, Kershaw and Hill (with a large dose of Kenley Jansen and others) rescued the Dodgers’ title raft in the National League Division Series against Washington. Following two more victories in NLCS Games 2 and 3 against the Cubs, the Dodgers will look to circumvent their Game 4-5 losses and complete a happy repeat. To continue scavenging sea and sky for good omens, know that those two wins followed an 8-4 Game 1 loss that played out similarly to Game 5, even to the final score. Tonight, the Dodgers fell behind early, tied the game — then watched that tie broken thanks to a home run off the previously stalwart Joe Blanton. There was even another late five-run eighth inning to ride out, and an even later short-lived comeback attempt. Tomorrow really is just a day away. Friday’s opening game of the National League Division Series between the Dodgers and Nationals comes in about 24 hours, depending on when exactly you’re reading this. Dodgers at Giants, 1:05 p.m. Though the 2016 regular season isn’t officially over, the month of September is, a month in which several Dodger bats delivered. Joc Pederson led the National League in slugging percentage (.702) last month and finished second in OPS (1.154) and fourth in on-base percentage (.452). 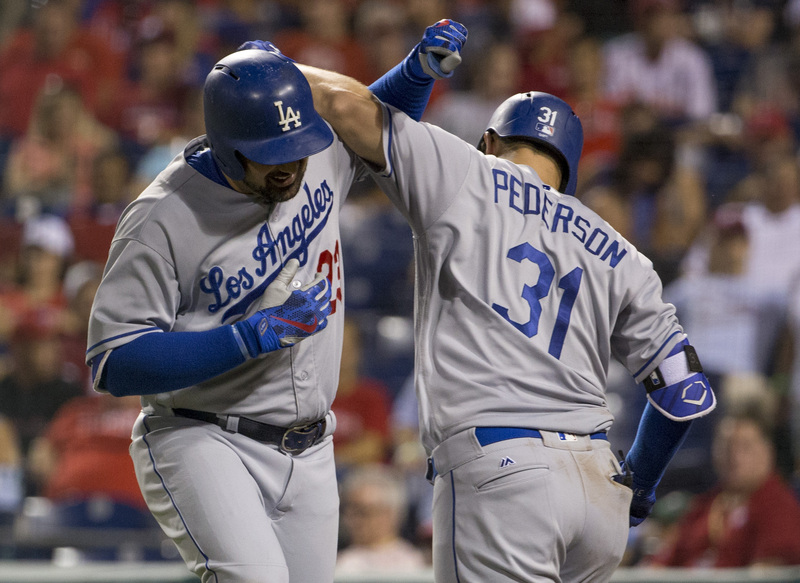 Pederson led the Dodgers with seven homers and 15 walks. Over to Pederson’s left — in right field — were two strong hitters. Josh Reddick rallied from a dismal August to tie for the NL lead in batting average (.400), alongside a .435 OBP and .569 slugging percentage. Reddick was due, to say the least — his batting average on balls in play went from .194 in August to .429 in September. Rockies at Dodgers, 1:10 p.m. 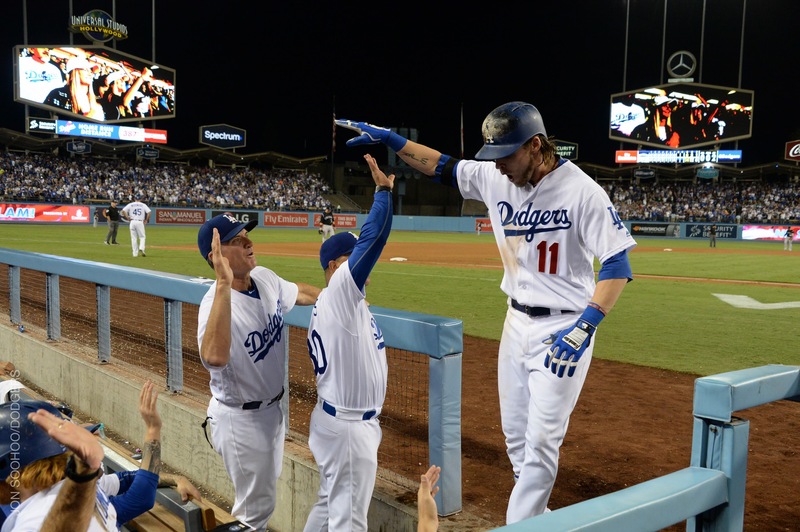 The Dodger outfield has chosen September to start asserting itself. Perfect example — Saturday night. The trio of Josh Reddick, Howie Kendrick and Joc Pederson went a combined 5 for 10, scored seven runs, knocked in seven and reached base eight times. And in the bottom of the seventh, Reddick pounded a Christian Bergman pitch into the Rockies bullpen for a grand slam — his second homer as a Dodger. Not only did the Dodgers make their most sudden comeback in a season filled with them, they did it against left-handed pitching. 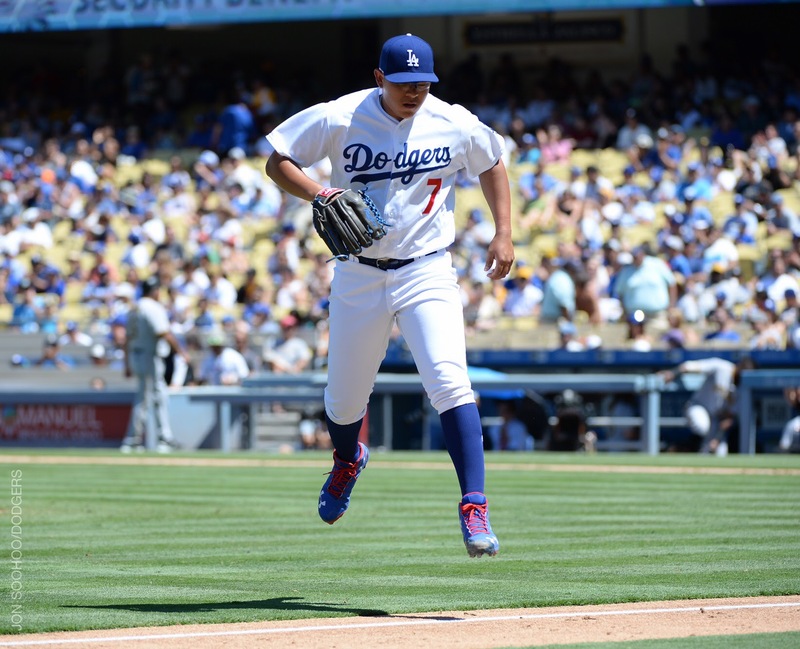 Trailing by six runs before they got their first baserunner, and down 7-1 in the sixth inning, the Dodgers battled back to take a 9-7 lead … only to fall in 12 innings, 10-9. The Dodgers’ six-run sixth matched their second-highest tally in one inning this year — and represented the biggest single-inning deficit they’ve erased all year. Dodgers at Phillies, 4:05 p.m. The Dodger offense has been sensational over the past several weeks, and part of the reason for this post, believe it or not, is to remind people (OK, me) that they can’t stay this hot forever. Right now, the Dodgers have an .814 OPS since the All-Star Break, which is 30 points higher than the Los Angeles record for second-half OPS of .784 by the 2008 Dodgers. In franchise history, only the 1953 Dodgers have had a higher OPS after the All-Star Game. In every other way, this was Chase Utley’s night. He was welcomed home by his longtime fans in Philadelphia with a prolonged standing ovation. He homered — against the Phillies — and they begged him for a curtain call. He hit a grand slam, and the begged him for another. 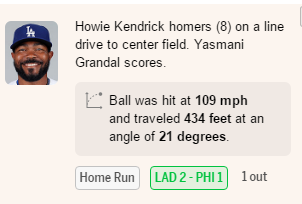 But in one very specific way, tonight was about the fact that we are in the midst of one of the most meaningful stretches of Howie Kendrick’s 11-year MLB career. The Dodger Insider cover guy ripped a mammoth two-run homer to center and flipped a one-run deficit in the fifth inning, part of a 4-for-5 night in the 15-5 victory that, pending the final score of the Giants’ game against Pittsburgh tonight, put the Dodgers in a tie for first place in the National League West. Howie Kendrick had one of his best weeks as a Dodger over the past seven days, going 10 for 21 with a walk, a home run and five doubles for a 1.357 OPS. At this moment, Kendrick’s adjusted OPS for the 2016 season is 100, which is the equivalent of league average. But this has been anything but an ordinary season for Kendrick, who had to adjust to becoming the Dodgers’ primary left fielder after spending the previous 10 seasons almost entirely at second base. In the cover story of the most recent Dodger Insider magazine, we talked to Kendrick as we detailed the transition. Read the entire story by clicking here. Beginning this year, the Dodgers merged their previously separate Playbill and Dodger Insider magazines into one publication (at least 80 pages per issue) with a new edition available each homestand plus one in October, 13 issues total. It is distributed at auto gates (one per vehicle) and via Fan Services for those who use alternate transportation. Dodger Insider magazine includes news, features, analysis, photos, games, stadium information and more. Fans who still wish to subscribe can do so at dodgers.com/magazine. There are more questions about Brandon McCarthy, but at least the Dodgers had multiple answers for their two-game losing streak. Jon Weisman is director of digital and print content for the Dodgers and the writer of "100 Things Dodgers Fans Should Know & Do Before They Die." Cat Belanger is the Dodgers' coordinator of broadcast and entertainment. Yvonne Carrasco is the Dodgers' assistant director of public relations. Erin Edwards is the coordinator for the Los Angeles Dodgers Foundation. Cassandra Lane is the Dodgers' manager of community relations. Mark Langill is the Dodgers' team historian and author of several books on the team. Matthew Mesa is the Dodgers' social media coordinator. Cary Osborne is the Dodgers' digital and print content coordinator.